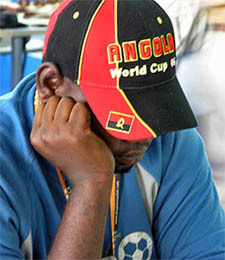 "Chess - Eduardo Pascoal, Catarino Domingos Selected for African Cup," Angola Press Agency, 12 Octoberr 2006 (Luanda, Angola). The national chess champion Eduardo Pascoal of EPAL team and the vice champion, Catarino Domingos, will represent Angola in the African championship scheduled for November, in Libya. A source from the Angolan Chess Federation (FAX) has said to ANGOP that the two players gained access to the competition in accordance with the regulations of the African Confederation of this sports, which selects the champion and the runner-up of all member countries, for this continental championship. The source has also informed that for this African competition FAX intends to reinforce the national team with the international masters Adérito Pedro and Eugénio Campos.